Tom Dascombe has taken a leaf out of the book of his jump racing colleagues with his handling of Brown Panther this season, with the Artemis Goodwood Cup the second leg of a four-race plan. 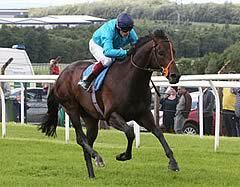 Today’s three-and-a-half length Group Two success followed victory in a Listed contest at Pontefract and next on the five-year-old’s agenda are the Irish St Leger and then the Melbourne Cup. 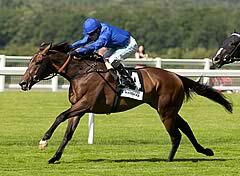 “We perhaps haven’t done as well as we should with him since he won at Royal Ascot at three,” said Dascombe. “So we’ve decided to be careful and pick just a few targets in a season, and make absolutely sure we get him right for each one, like the National Hunt boys do, and it seems to be working. The Artemis Goodwood Cup is the biggest success of Dascombe’s career to date, and his first winner at Glorious Goodwood. A step up to Group One level again is next in the Irish St Leger at the Curragh in September, a race in which Brown Panther was beaten a head and a short-head into third last year. The Goodwood Cup was also rider Richard Kingscote’s best result. “I had to ask him out of the stalls to make sure he held a position,” he said, “but he travelled good all the way. It was a genuine pace and turning for home I was actually pretty confident. I wanted to keep him up there because I didn’t want to be caught for toe – he likes to be involved in a race early and then grind it out. Today’s step up to two miles helped. “He’s become more straightforward to ride as he’s got older; when he was younger he could be a bit quirky. He’s a horse who likes a race to go his own way, if there’s a sprint to the line and he gets left, he loses interest. I was delighted after the first couple of furlongs to get a lead and I was just a question of enjoying it for the next mile.He likes to be put into a race early so he can boss it a bit and once he saw the gap today and put his head through it he just took off. Trainer Saeed bin Suroor felt that Ahzeemah relished the step up in distance to two miles for the Artemis Goodwood Cup when the four-year-old finished three and a half lengths runner-up to Brown Panther. German raider Altano was three-quarters of a length further back in third and Christa Germann, assistant to Andreas Wohler, commented: “He ran a good race in the Gold Cup at Ascot, which was his first time in this sort of race, and we could go for the Prix du Cadran and then the German St Leger four weeks later.